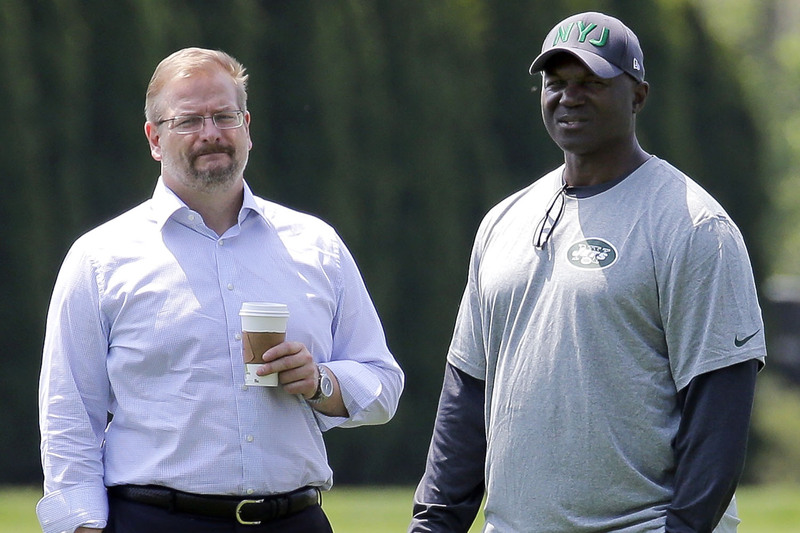 Jets extended the contracts of general manager Mike Maccagnan and head coach Todd Bowles. The Jets ENDED any UNCERTAINTY around their front office going into the LAST game of the season. It seemed a FOREGONE conclusion in the preseason that head coach Todd Bowles was going to be FIRED at the END of the season, but the season panned out DIFFERENTLY than the preseason expectations. EVEN THOUGH both the GM Mike Maccagnan and Bowles were brought back, they NEED to do more to stick around for the LONG term. The Jets will finish at WORST 5-11 this season, but most experts did not think they would even SNIFF FOUR wins this season. Bowles has OVERACHIEVED with this roster and DESERVED to coach this YOUNG roster for another season but he still has some HOLES in his coaching strategy. Bowles is GREAT motivating his players but has had DIFFICULTY managing in-game situations that could have helped the Jets get ONE or TWO more WINS this season. This offseason and next season, Bowles needs to become a BETTER in-game coach to be considered a GOOD coach in the NFL. I like Bowles as the head coach of the Jets, but he has NO personality in front of the media, if he shows more personality to the media, then the fans will NOT HATE his low key demeanor. Mike Maccagnan was brought here from the Texans and was GREAT in his FIRST season with the Jets, finishing ONE game out of the playoffs. He has really struggled building a GOOD roster over the last TWO years and that has hurt the SUCCESS of the Jets in those seasons. He has to build a BETTER roster this offseason and build a contender for Bowles and the rest of the coaching staff. The Jets have drafted TWO quarterbacks under this regime and neither has panned out. The Jets NEED to find that TRANSCENDING talent at quarterback, which will expedite their rebuilding plans. The main goal for Maccagnan in this off season is to FIND a quarterback for the Jets that can lead them to the playoffs over the next FEW seasons. Maccagnan has not had any LUCK drafting quarterbacks, so maybe they can look at getting a quarterback in free agency like Kirk Cousins or Jimmy Garroppolo to solve their WOES at quarterback. THE JETS NEED TO FIND A QUARTERBACK VERY SOON!!! The Jets ownership has not talked about what they want to do with the rest of the coaching staff, it will be INTERESTING to see what they do. The Jets should re-evaluate the OFFENSIVE coaching staff because offensive coordinator John Morton and quarterbacks coach Jeremy Bates have not had GREAT seasons for the Jets in their first year with the team. The Jets need to find a new offensive coordinator that is willing to work with the quarterback they find to build an offensive core, which is not the specialty of the Jets. The defensive coaching staff has no real issues, but it does need some TUNING. The Jets have a lot of YOUNG players on the roster, so they need to keep the same coaching staff around for those YOUNG players. The Jets have made some SMART decisions with resigning Bowles and Maccagnan, but they need to do MORE on the team to lead them to the playoffs next season.